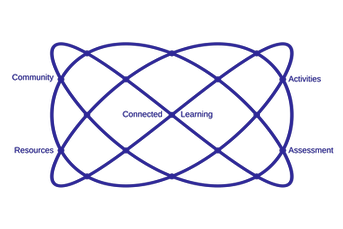 The unit is built upon -and aims to model - connected learning principles. It supports an evolving network of people, ideas, information and digital technologies. Learning activities and assessment are interwoven. They are designed to be transferable to contemporary learning contexts. In the spirit of connected learning we will be using a suite of social media in this unit. The unit materials are mainly located on this website. For privacy reasons some materials such as the links to our web-conference tutorials and the tutorial recordings will be located in our unit Blackboard site. We will interact via a closed G+ Community, and via Twitter #LCN600. People not enrolled in the unit and who are interested in engaging with us on connected learning are welcome to use the resources on this website and to interact with us via Twitter #LCN600. Go to the unit Blackboard site. In the Learning Resources you will find the link to the closed class G+ Community. Click on the link and join the Community. Here is information about setting up a G+ profile. You are welcome to use an abbreviated form of your name or a pseudonym. Here is a beginner's guide to G+ Communities. Get started in the G+ Community by posting an introduction to the category Individual Profile. ​Looking forward to learning with you in the unit!